You’re a U.S. soldier, motoring across the desert at 60 miles an hour in an Army truck, heading back to base. Suddenly, a red light flashes on your dashboard—an instrument has detected traces of explosive material on the road surface ahead. You divert around the hazard and continue safely toward your destination. “There is currently nothing available to do this at this speed,” says Bradley Arnold, professor of chemistry and biochemistry. But that could soon change. Today, in order to detect hazards, service members must pause and send a robot to check an area of concern. This procedure slows progress, which can increase risk for military personnel trying to move through an area quickly. However, technology to make high-speed, near-comprehensive detection possible is close to coming to the U.S. Armed Forces, thanks to Arnold’s work. Arnold’s research group recently received $480,000 for two years from the U.S. Army to develop a prototype of their detection device, which has been in development for three years. The Army will test it on military vehicles early next year, and if it passes field tests, it may be deployed soon after. 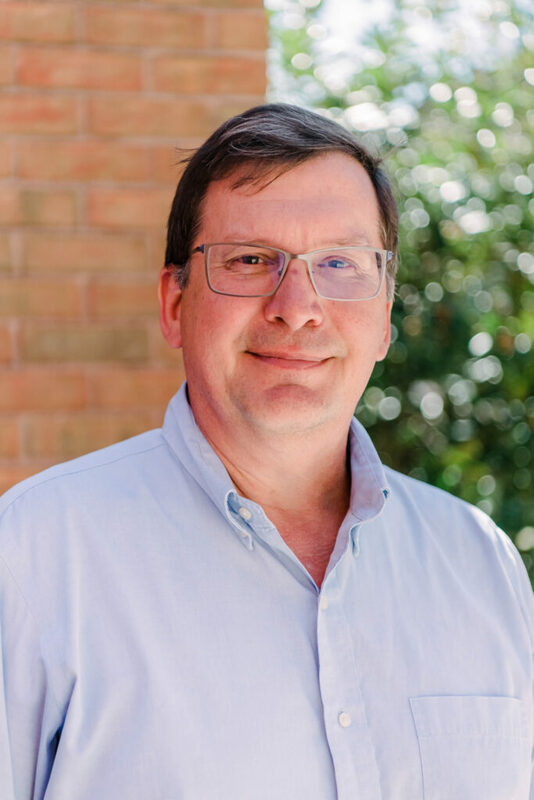 Bradley Arnold, professor of chemistry at UMBC. So how does it work? The device sends out 10 laser pulses per second as the truck drives along, and each laser pulse contacts about one square inch of the ground. At 60 miles per hour, one pulse hits the ground every eight feet. Arnold’s team is working to develop lasers that can pulse more rapidly. Then, the beams could overlap—even at high speeds—providing complete coverage. The system collects the light that scatters off molecules on the ground in a specialized detector. Depending on the structure of their chemical bonds, different compounds generate unique scattering patterns. By analyzing those patterns, the detector “can identify a molecule’s characteristic fingerprint,” Arnold says. The new system can identify “just about anything,” Arnold says, from compounds used in military or improvised explosives, to nerve agents, to biological threats. “Being able to detect these things on the fly is of critical importance,” he adds. The new device would make this possible for the first time. The basic technique the device employs is related to standard Raman spectroscopy, used in chemistry labs all over the world, but with one very notable difference. In standard systems, a lens focuses the laser beam on a single point. But too much power focused at one point can destroy the thing you want to detect. To make the traditional method work in this case, Arnold’s team would need to reduce the power of the laser so much that they’d lose the benefit of having a high-powered laser to begin with. Their solution: remove the focusing lens, even though “99.9 percent of the universe insists the lens is required,” Arnold says. Without the focusing lens, the laser beam is about three-fourths of an inch across when it strikes the ground. “We can turn the power up on the laser several orders of magnitude, and we don’t have to focus it on a single spot—that entire area is imaged onto our detector,” Arnold explains. In this setup, the detector is less efficient at collecting the scattered light, but the high power of the laser compensates for the inefficiency. 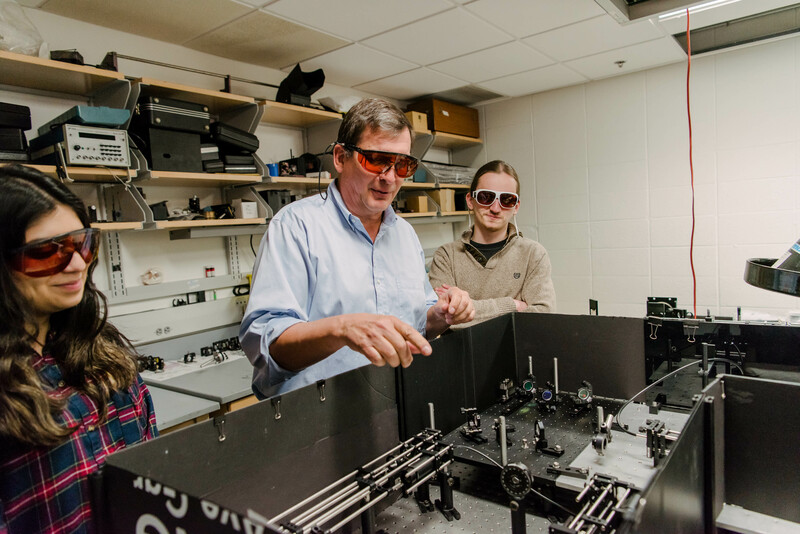 Brad Arnold (center) examines the laser setup with Sara Tahir ’21, biochemistry, and Eric Bowman (right), Ph.D. student in chemistry. As a future step, Arnold would like to work toward a lighter version of the device that could fly on a drone ahead of military convoys. He has submitted a Small Business Innovation Research grant to support efforts to that end. In addition to military uses, Arnold is also thinking ahead to potential civilian applications. For example, a similar system at airport security could remove the need to swab suspect bags to detect trace materials on their surface. Instead, every bag’s surface would be automatically analyzed using this new system. It could even be used for security at stadiums or other large venues. In the event that the military adopts the technology, and especially if civilian applications come into play, a way to produce the systems at scale will become necessary. With that in mind, Arnold has founded NuMoon Spectroscopy with support from a TEDCO Maryland Innovation Initiative grant. Arnold loves the idea of seeing the technology do good in the world, which is why he has shepherded this project to the startup company stage. “This could be not just cool, but important,” he says. Banner image: Brad Arnold (center) works in the lab with Sara Tahir ’21, biochemistry, and Eric Bowman (right), Ph.D. student in chemistry. All photos by Marlayna Demond ’11 for UMBC.